Yep, whoda thunk? Right down in warm, palm tree filled Florida, a very expensive art museum recently opened to celebrate the arts of Mr. Salvador Dali, a famous artist from the 1900s, known mostly for his SURREAL art. His art relates to architecture in many ways – including his fascination with mathematics and the Golden Mean or the Golden Rectangle. We love the Golden Rectangle too. (here is some interesting info about it . Meanwhile, back at the ranch, or the museum in Florida… not only was Salvador Dali interested in it, he made artwork that illustrated concepts about space that were unusual and thought- provoking. 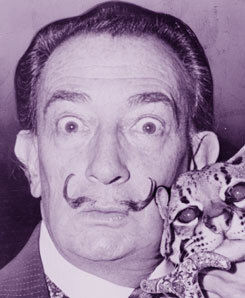 And his moustache was thought-provoking itself – all curly and upward and somtimes with flowers attached! 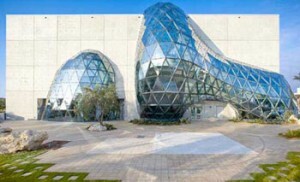 The new Dali Museum is itself a work of curious and unusual form – built with over 900 triangles of glass – in a sort of geodesic dome formation that undulates and backbends on the exterior of the building. It was designed by HOK, a big time architecture firm, and engineered by a frim called Norum Structures. The triangular structure is a modern version of the domes of Bucky Fuller – a wild thinker from America as well. Build Your Own- Like Abe Lincoln Did!